Hitman: Agent 47 is sometimes as handsome as its title character, but nowhere near as capable. Don’t let the derivative title fool you: Hitman: Agent 47 isn’t the forty-seventh movie about assassins, special operatives, and human weapons to be released in 2015 – it just feels like it is. We’ve had TV revivals, sends-ups, spoofs, and sequels aplenty in the espionage field these last eight months, and most have been satisfying distractions. November’s new Bond movie could be the corker ending to a year defined by a spycraft obsession, or be the one martini too many that tips audiences into a genre hangover. Compared to these world-renowned agents affecting the box office balance of power, the disposable Hitman: Agent 47 is just a gun for hire: it enters and exits the screen unnoticed, leaving no trace of its existence except the 96 minutes of your time it just killed. There’s a calculated logic to 20th Century Fox signing another contract under the “Hitman” name: franchises have been founded on less than the evocative red tie, bald head, and barcode sported by Agent 47, here assayed by Rupert Friend. A GMO (Genetically Modified Operative), 47 was previously played by Timothy Olyphant back in 2007, when Fox first attempted to port the popular video game series to film. Friend proves a better fit for the part than Olyphant, the latter too naturally charismatic for the cool remove required of a sociopath. (Friend’s adopted American accent, meanwhile, racks up air miles on its frequent journeys back and forth across the Atlantic). In keeping with the masterly company, let’s start with the pros. Like its titular numeric executioner, Agent 47 is a looker. What eye candy there is to enjoy is rarely provided by first-time director Aleksander Bach, whose action scenes are at their most coherent when spotlighting CG effects that should have been left in the background. That he forgets to include space-establishing two shots until well into some dialogue scenes is a more mundane problem. But cinematographer Óttar Guðnason gives the movie a sharp appearance throughout, even in the service of scenes that function better as ads for Audis and Singapore tourism than hair-raising spectacle. 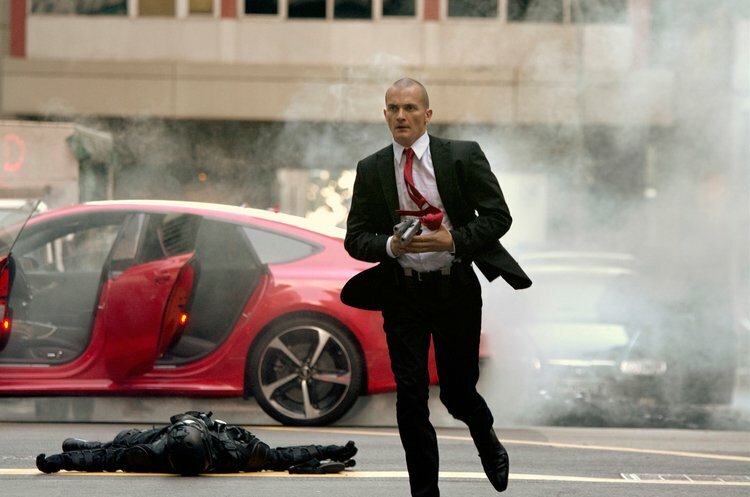 The best that can be said of Hitman: Agent 47’s plot, meanwhile, is that there’s a particular dynamic to it worth cloning and putting into a better movie. Hannah Ware plays Katia van Dees, the daughter of a missing scientist. Back in the ‘60s, Mr. Dees (Ciarán Hinds) was responsible for creating a supersoldier program that brought Agent 47, and at least 46 other deadly assassins into the world. Syndicate International, a nefarious organization (saying this is redundant, right? ), wants Katia’s father. 47’s employers want her dead. When a ludicrously unstoppable killing machine is dictating the pace of your silly action movie, much can be forgiven, or at least, ignored. Yet Hitman: Agent 47 runs its goodwill tab into a deficit almost right from the start. The movie is quickly riddled with plot holes as the script belt-feeds you cliché after cliché. These weaknesses wouldn’t be half so frustrating if they didn’t take up such a large percentage of the runtime. Any momentum gets stonewalled by lengthy dialogue scenes that run in circles, lack chemistry between the actors, reiterate exposition, or combine all three into a numbing audio-visual anesthetic. It’s not until around the midpoint that the movie finally gets stupid enough to have a little fun. Why do the characters end up in an aviation factory all of a sudden? Who knows, but it’s an entertaining playground. It’s impossible to take Hitman: Agent 47 as seriously as it takes itself, but it grows marginally more tolerable to follow as it moves through the standard issue list of high-speed pursuits, gunplay, and fisticuffs. In each setpiece, craft and imagination battle for the dubious honor of being closest to the source material. Katia sneaking by airport cameras is about as tedious as your average video game stealth mission. When 47 trashes motorbikes in a sensibly constructed car park chase, or picks off henchmen ziplining toward his harpooned vehicle, the poorly computer generated casualties could be charitably described as an homage to PS3-era graphics. Perhaps tellingly, the closest thing Hitman: Agent 47 has to a novel idea is one that’s antithetical to the individualistic power fantasy of the games. Circumstances conspire to set 47 and Katia against a common enemy, him training Katia to harness her inner badass, often mid-dustup. There’s a mild playfulness, even a little humor to their partnership that the po-faced rest of the movie doesn’t realize it should be playing up. This is a fiction where characters don’t bat an eye at the phrase “subdermal titanium body armor” – any occasional wink becomes a godsend. Too often, though, Hitman: Agent 47 has no identity distinguishing it from the straight-to-video fluff you’ll find in any supermarket bargain bin. Run Agent 47’s barcode under the scanner while you’re passing by the checkout, and you’ll ring up a turkey.